With so many local businesses offering amazing gifts to honor mom this year, Montco Happening has put together a 2016 Guide that features them all! In addition to great gift ideas, we’ve also got local events, brunches and things to do in our area with the special woman in your life. Does mom deserve something extra special this Mother’s Day? You can enter to win a special treat for her – an amazing prize package from the brand new state-of-the art Upper Merion Community Center which is set to open this summer. When completed, the new facility will offer Upper Merion residents a state of the art fitness facility, pool, recreational programs, gym space, and new walking trails. The event space will even include an art studio and cooking classes. Aerobic Rhythmics, Inc. has been keeping the community fit for over 35 years with multiple locations throughout Montgomery County. The growing facility offer Aerobic, Zumba, Yoga, and Aqua classes for people of all ages and abilities. Their year around, 8-week sessions are the perfect way to get back into the swing of feeling, and looking your best! Aerobic Rhythmics offers workouts that are a fun 1-hour full body workout set to music. Next session begins April 25th and runs until June 18th. With Mother’s Day on their minds, Aerobic Rhythmics is also offering a Mother’s Day Special for all mothers and daughters. Buy one month at $35 for yourself, and bring her for free! Click here to learn more information, or feel free to call (610) 489-3180. Forcella is an 18-seat plush BYOB in the heart of downtown Jenkintown offering simple, elegant, fresh, produce-driven seasonal fare. Their aim is to provide exceptional service, fresh & dynamic selections and an overall experience that is personal, memorable and unique. Be sure to keep them in mind for your Mother’s Day celebration as this is one meal that mom will never forget. Treat her to a fresh, gorgeous, unique, one-of-a-kind experience, that any mom would love. Be sure to refer to Forcella’s website for all holiday menus. Whether it’s fresh, unique, cutting edge menus, amazing décor and ambiance or the personal service and attention to detail that is second to none, Forcella BYOB is the perfect place to host your Mother’s Day festivities. The quaint and quiet village of Skippack has been making memorable Mother’s Day memories for years, and 2016 will be no different! Come celebrate all that your mom means to you in one of Montco’s most beloved towns as the community prepares to host their annual Skippack Spring Fest! The Spring Festivities kick off Mother’s Day weekend with a wide collection of craft and artisan vendors offering an array of gifts that are handcrafted right here in the USA. Warm your mom’s heart by getting her gifts that were made from the heart! Sunday of Skippack Spring Fest is Mother’s Day! Bring Mom out to stroll the charming streets of Skippack while you shop, enjoy live music, eat, drink, and enjoy all the entertainment that Skippack Village has planned! With free parking in the back, you can start and end the day at Skippack’s Victorian Carriage Shops. Don’t miss out on one of our biggest weekends of the year! Come celebrate our favorite person in the world – mom! Painting with a Twist offers a wide variety of paintings for every kind of mom, whether she loves flowing wine, blossoming flowers, or maybe some sci-fi geekery! Please see calendar for specific prices, age recommendations and age restrictions. 18+ and 21+ BYOB unless stated otherwise. Not only is it the site of Montco’s 4th Annual Happening List Red Carpet Bash, it’s also an amazing destination to take mom this year. Treat her Mom to a decadent buffet featuring made-to-order omelettes, carving stations, fresh-made pastries, and so much more. After brunch, stick around and tour all that the VF Casino & Resort has to offer! Ticket pickup will be located at the Box Office near Valley Services beginning at 8am. Please ensure your party arrives to the box office at the same time in order to be seated together. Beauty and skin care supplies are always a great buy for mom on her special day, and LUSH Cosmetics in King of Prussia is reinforcing that fact with products that every woman is sure to love. That’s because LUSH specializes in hand crafted, homemade soaps, fragrances and more! Each one of their products is made from all natural sources like organic fruits and vegetables. The team here at LUSH also take great pride in selling our county items that have never been involved with animal testing of any kind!!! They believe in happy people making happy soap, and that every woman and mother has the right to enjoy candlelit baths, sweet smelling fragrances and all natural bath and body soaps. This store is just as unique as the mom’s we are honoring so stop in to see their friendly staff and check out the Mother’s Day gift sets! For over 50 years, the Kremp Family has been providing unparalleled service as the premier florist in the Philadelphia area. They are open and delivering 365 days a year, and their dedicated team will be more than ready to take your order this Mother’s Day. Same day delivery of everything you send, from gorgeous flower arrangements to gourmet gift baskets to house plants is just part of what this business has to offer! Each gift you send is backed by their unwavering satisfaction guarantee. They encourage everyone to visit their website for hundreds of great gift options, send flowers by the bunch, or to send an exquisite, one of a kind custom silk arrangement. Kremp also offers all of the classics like beautiful roses in all colors, gift baskets for all occasions, delicious fruit and gourmet gift baskets, premium wine and wine gifts, indoor and outdoor plants, candles, jewelry and more! One of Montco’s most Happening chefs and his culinary team will be serving up a Mother’s Day brunch that she’ll never forget! Treat your Mom to a delicious brunch. They’re offering a massive Grand Buffet for $45 ($16 for kids 12 & under). Relax and enjoy Bottomless Mimosas & Bloody Marys for $14! Located in the heart of downtown Ambler, Dettera not only provides exceptional food, but the location makes for a perfect day of shopping with mom in any one of Ambler’s retail stores, before or after brunch. Be sure to check out their award winning wine list too! Sullivan’s Steakhouse is a vibrant neighborhood American Steakhouse featuring the finest steaks, seafood, hand-shaken martinis and live music. They are inviting everyone to treat their Mom to brunch at Sullivan’s on Mother’s Day! Celebrate Mom and treat her to an amazing Mother’s Day at Sullivan’s Steakhouse. Enjoy our three-couse brunch menu of chef-inspired cuisine paired unsurpassed hospitality. Citrus Salon & Day Spa is the ideal spot to get mom a gift card this year. The salon has everything from haircare, nailcare, makeup to waxing while their top of the line spa offers massage therapy, facial care, body treatments and more. The staff, stylists and owners at Citrus are dedicated to honoring and pampering the women we love, especially on Mother’s Day! What better way to celebrate Mother’s Day than enjoying “An Afternoon Paris”? 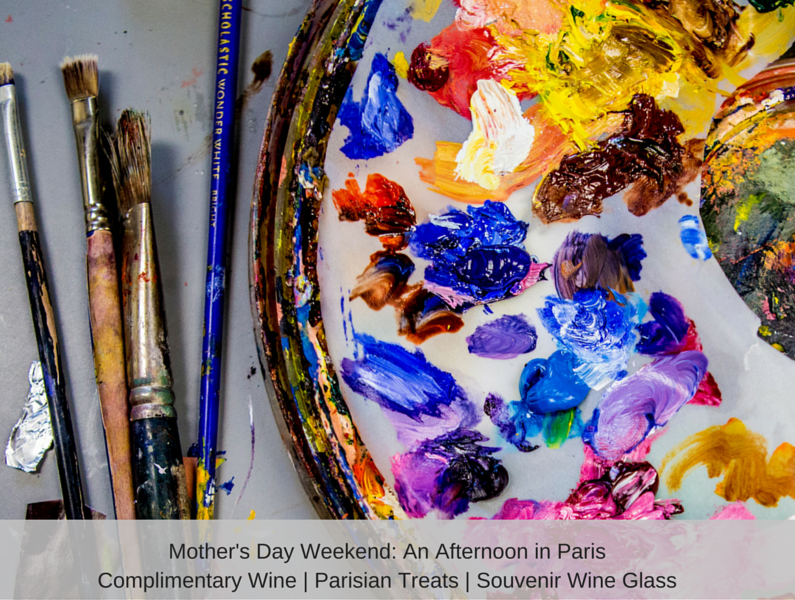 You will be painting, sipping, enjoying Parisian treats on the patio of Cardinal Hollow Winery. Since 2001, Orchard Artworks has been the place to find fine art and contemporary crafts amid the historic Powell farmhouse atmosphere. Visit with artists – the art cooperative is run by 40 local members. For Mother’s Day, you can find unique jewelry, hand knit light weight scarves and handmade pocket books. Jonathan’s spoons, wooden desk accessories, bowls, pens and toys, woven baskets and ceramic pieces make lovely gifts for the house. There are greeting cards and art including oils, pastels, photos and sewn wall hangings. Gift certificates are also available! Do You Want To Be Featured In Our Mother’s Day Gift Guide 2016?